Aphrodite Hills Golf & Spa Resort offers a unique selection of deluxe apartments and villas located within this expansive and beautiful resort, all of which are individually styled with superb interior decor. Special offers available on villas with private pool now! Other dates/durations available, please use our live chat service or call our friendly 'luxury holiday experts' for more details and to book. Aphrodite Hills Golf & Spa Resort Residences features deluxe apartments and villas with panoramic views of the golf course or Mediterranean Sea. Its full-service spa boasts 27 treatment rooms and an outdoor massage section. Nestled in the hills above Paphos, Aphrodite Hills Golf & Spa Resort offers incredible luxury experiences like no other. With our award winning Villas & Apartments, your accommodation choice is only the beginning of your holiday in Cyprus. Our exclusive Aphrodite Hills Golf & Spa Resort Vilas are perfect for those who enjoy a little more freedom or space. Choose from 2, 3, 4 or 5 bedrooms, all with fully equipped kitchens and lounge & dining areas. Many of our Villas have private pools and gardens and others enjoy communal pools. With a choice of different settings around Aphrodite Hills Holiday Resort, enjoy Villas with Golf Course, Garden or Mediterranean Sea views. All Aphrodite Hills Golf & Spa Resort room types feature a hairdryer, balcony or terrace kitchen facilities (electrical appliances, microwave, washing machine, fridge/freezer, toaster, electric kettle, hob, electric cooker/over), sitting and dining area, TV, DVD player, Wi-Fi internet access (free), air conditioning and heating (according to season), safety deposit box, iron/ironing board and tea/coffee making facilities. 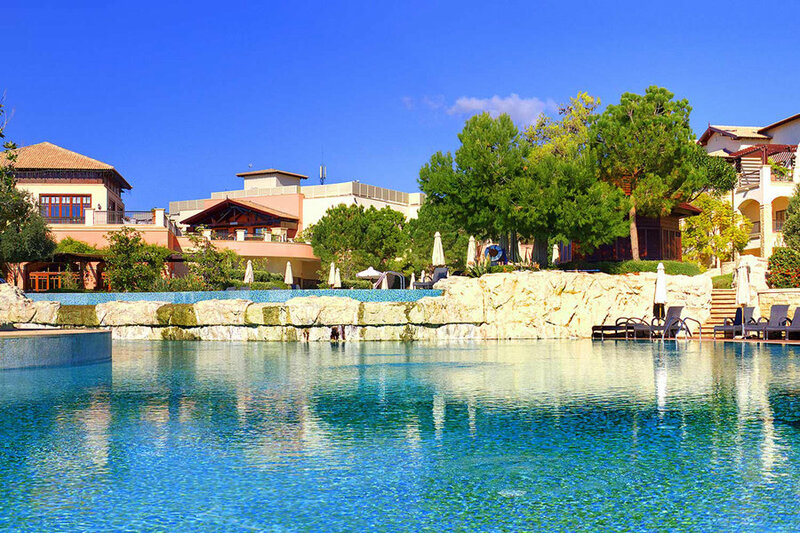 Aphrodite Hills Golf & Spa Resort is located on an elevated part of the Resort above the Mediterranean Sea. It features a range of treatments, sauna and hamam. The Pirates Village features a spacious indoor Kids Club for ages 3 to 12 years, a separate baby Crèche which caters for babies 6 to 35 months, shaded play areas, an outdoor adventure playground (bouncing castle and trampoline), a multi –purpose surface court and a 75 m² children’s swimming pool with active water slide. Golf lovers can enjoy the 18-hole championship standard golf course, complete with clubhouse and academy. The characteristic Resort Village Centre provides hours of retail therapy and entertainment. It is comprised of boutiques and shops, a German themed Beer Garden, The Pithari Tavern – with the traditional tastes of Cyprus, The Zimi Trattoria – a traditional Italian dining concept, Ladi kai Rigani Kebab House, The Gate to India – offering a unique dining experience, serving innovative Indian cuisine in an elegant and stylish setting and the Anoi Pub&Bar – located in the heart of the Resort, decked out in distinctive wooden pub-style furniture with its terraced area offering spectacular panoramic views. With options of 2 or 3 bedroom villas housing up to six people, our Luxury Junior Villas are perfect for a relaxing low key stay at Aphrodite Hills. Our Junior Villas come with a number of added extras, including communal pool access, or the added option of a private pool as well as access to the Aphrodite Hills resort village and a whole range of onsite activities just within walking distance. Each apartment comes fully furnished with full kitchen, spacious living room complete with TV/DVD facilities, air conditioning and private balcony terrace with stunning panoramas over the nearby mountains, golf course or out onto the Mediterranean. The Aphrodite Hills Spa is located on an elevated part of the Resort above the Mediterranean Sea, with truly spectacular views from the outdoor pool and even the sauna. State-of-the-art facilities and an expert team of therapists await residents, guests and local visitors for the height of relaxation and pampering of the mind, body and soul. A great way to start off a tranquil day exploring Aphrodite Hills, The Retreat Spa is the perfect place to try a Greco-Roman detoxifying session. And why not round it out by a nutritional smoothie, healthy tonic or herbal tea from the Spa Restaurant and Juice Bar whilst absorbing the relaxing surroundings of the Spa’s sun deck or fragranced gardens. Mini Football Court, Two tennis courts, Sandy volleyball court by the beach, Archery, Fully quipped Gym & Indoor Heated Pool. Clasically-trained musicians on the main lobby terrace Night shows like cabaret acts, production shows, resident band and many more can be watched at the Show Lounge Stage (indoor) and at the Boardwalk stage (outdoor).